Next week Friday the 2018 hurricane season officially begins and if predictions are accurate the new season could be as terrible as the 2017 period during which Hurricane Maria's destruction set Dominica back more than fifty years when it killed more than 33 people and caused billions of dollars in damage. But if you look outside your window now, no matter the community of Dominica in which you reside, you will see that a large part of your neighbourhood is unprepared not only for a category five storm like Maria but also for a mild tropical storm. In fact our government has indicated that there are few hurricane shelters available after Maria and it has asked residents to provide their homes as shelters. Understandably Dominicans are already scared of the new hurricane season and the anticipated storms because they have not recovered physically or psychologically from the battering they received from Maria. Of course the best way to cope with these increasing devastating natural disasters, made worst by the climate change phenomenon, is to prepare like we have never prepared before. And we are not advising individuals only; government too has to step up on its preparations. If we do not, the 2018 hurricane season will be especially painful for Dominicans who have not had the opportunity to build back better, as the government slogan suggests, because rebuilding after Maria has not been as easy as we have been led to believe. Dominica is still a major "tarpaulin country" and most of the island is still without electricity and internet services. And that condition, for a large number of Dominicans, could continue for a few years. Let's all pray for minimal wind and rain during the upcoming season. 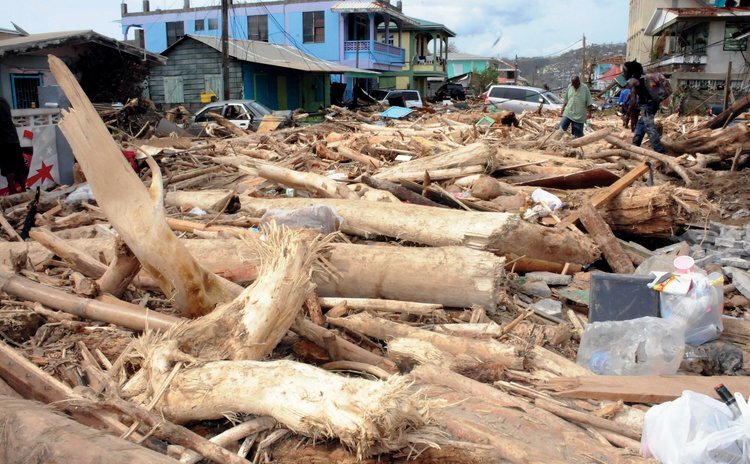 Apart from Hurricanes Maria and David, the two major storms to strike Dominica in this century, recent events illustrate the fact that despite its traumatic experience Dominica is not adequately prepared for even the mildest of natural disasters. The two mild incidents that we refer to are the collapse of the dam in the Layou Valley and the widespread flooding of Mahaut and Massacre after a few showers in 2011. And there have been other examples in the past. A few years ago a landslide buried three unfortunate souls in the south east village of San Sauveur. Whenever these incidents occur, ministers of government in particular, invariably pontificate about the need for the enforcement of laws which prohibit the construction of houses in disaster prone areas. And as if he was on cue, in 2010 we saw Senator Charles Savarin, the then minister responsible for disaster management, on a Government Information Service television programme saying that the Planning Department has the authority to prohibit the building of houses in these areas. Of course Mr. Savarin was correct but he knows as well as most of us that these, and many other standards, are not enforced. In an article published some time ago, Severin McKenzie, an architect who has much experience in disaster risk management, concluded that the disasters of 2011 mentioned earlier were essentially man-made and could have been avoided. "While most persons were admiring the effects of the disaster I was interested in the cause," McKenzie wrote. "There was one common denominator for the cause of damage at all the sites visited: obstructions in waterways, culverts were inadequate, debris stuck under bridges, bridges constructed without consideration for the free flow of water. In summary, the cause of the destruction was nothing more than poor construction practices". Has Maria changed any of that? Of course not. Over the last decade hurricanes have done untold damage to the agriculture and tourism sectors in particular. But given our experiences over the years, the most traumatic being Hurricane David in 1979, TS Erika in 2015 and Maria in 2017, one would expect Dominica to be much better prepared for the impact of hurricanes and other natural disasters. The point we wish to make is that our laissez- faire attitude to disaster management is not due to a lack of knowledge and experience; we seem to be devoid of the political will to take the necessary action to be better prepared for the impact of natural disasters caused by hurricanes, landslides, earthquakes and volcanoes. It would appear that we only give serious thought to natural disasters at the point when disasters are about to strike but during the rest of the year we ignore essential institutions such as the Office of Disaster Preparedness, the Red Cross and the Planning Department. In fact, the national budget which governments present every year to Parliament hardly ever mention disaster risk planning and the need to reduce the impact of natural disasters. We hope the 2018-19 budget will be different with the creation of the new ministry of the environment, climate resilience and disaster management. Minister Joseph Isaac has much more work than he can manage.